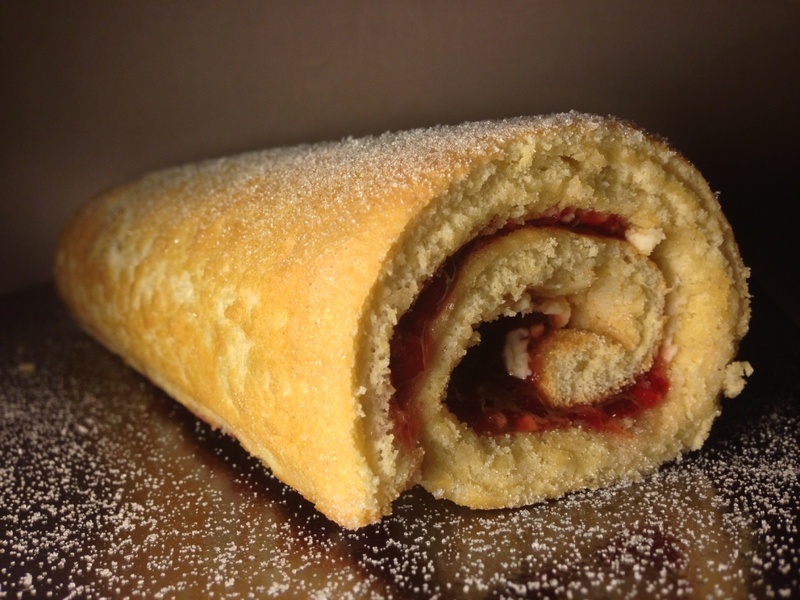 Swiss roll is not something that I’ve made before, or had a huge desire too. 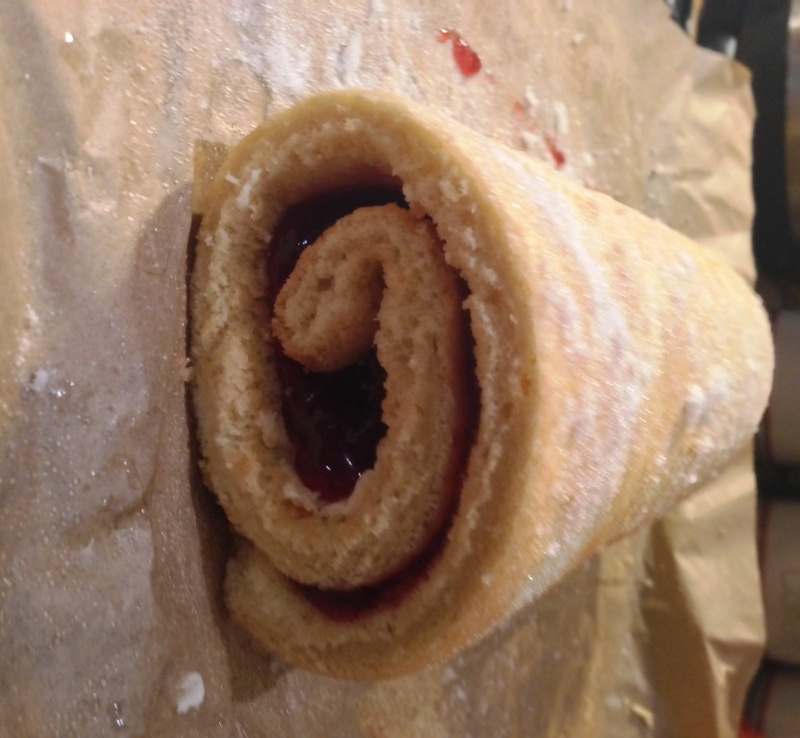 But, I had to make dessert for dinner at a friends last night, and oddly enough had a dream my mum was teaching me to make a swiss roll (albeit a chocolate one) – well, simple things please simple minds, my decision was made! On further investigation it turns out to be a delightfully simple dessert, quick and easy to make (less than hour from packets to plate) and so few ingredients! Would you believe the sponge is actually made without butter… so you could class it as fat-free or certainly low-fat. I vamped mine up a bit with some buttercream but the jam alone would have been more than sufficient. 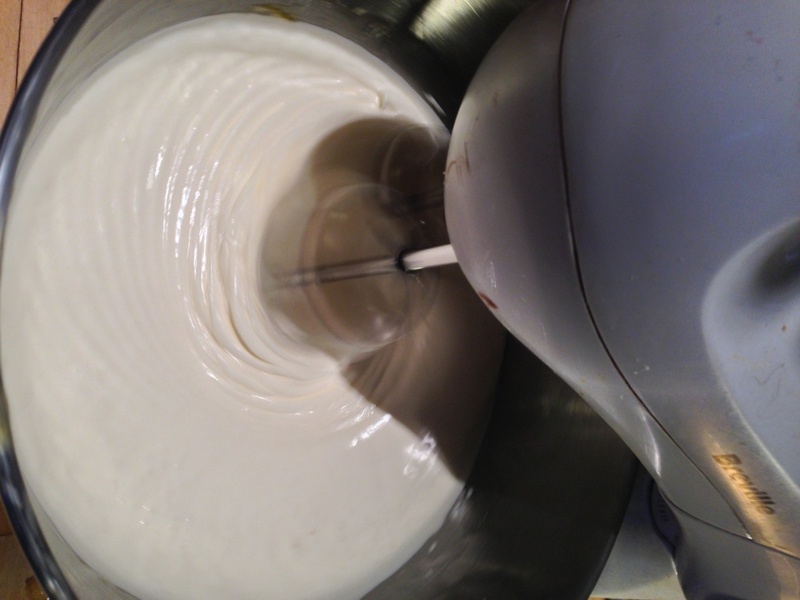 The method itself is also very simple – and vastly helped by having a stand mixer. 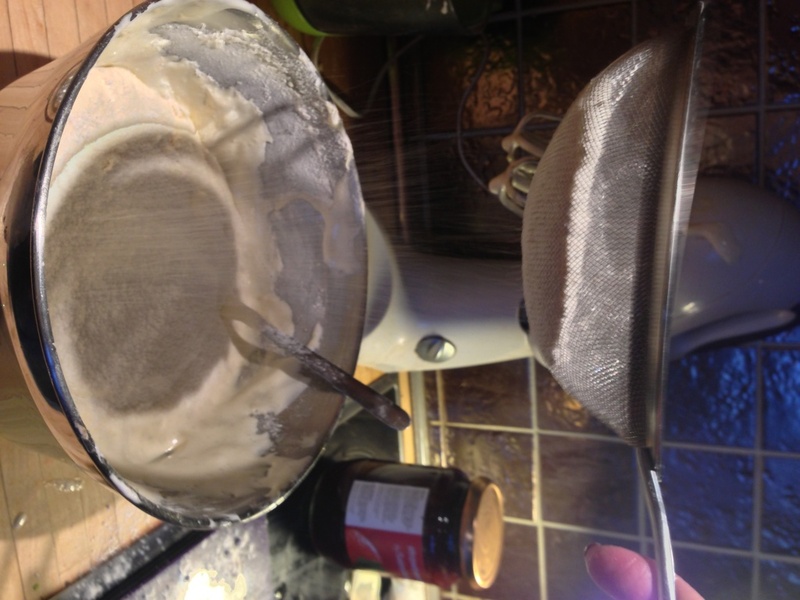 If you haven’t a hand-held electric mixer would work but I wouldn’t recommend doing it all by hand unless you’re feeling very, very strong…. If you are lucky enough to have a stand mixer (one of the best investments (ok presents from Rob) I’ve ever had, mine is a Breville and was only £50 from Tesco – unbelievably 2 years later it’s actually gone down in price and is now £44!) 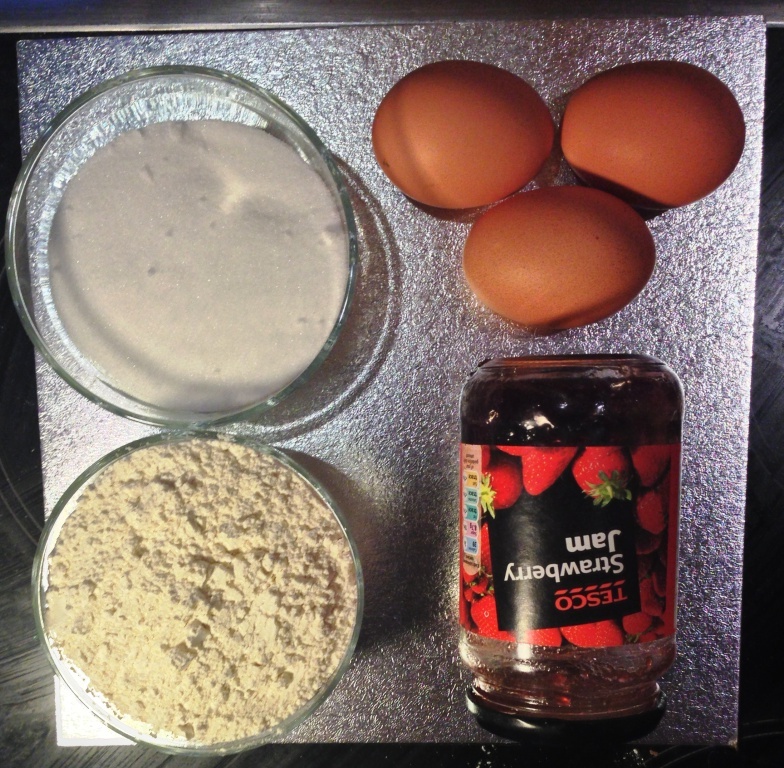 – then prepare your baking tray while the eggs and sugar are whisking. If not it doesn’t really matter if you have to let the mix set a few minutes once it’s made. 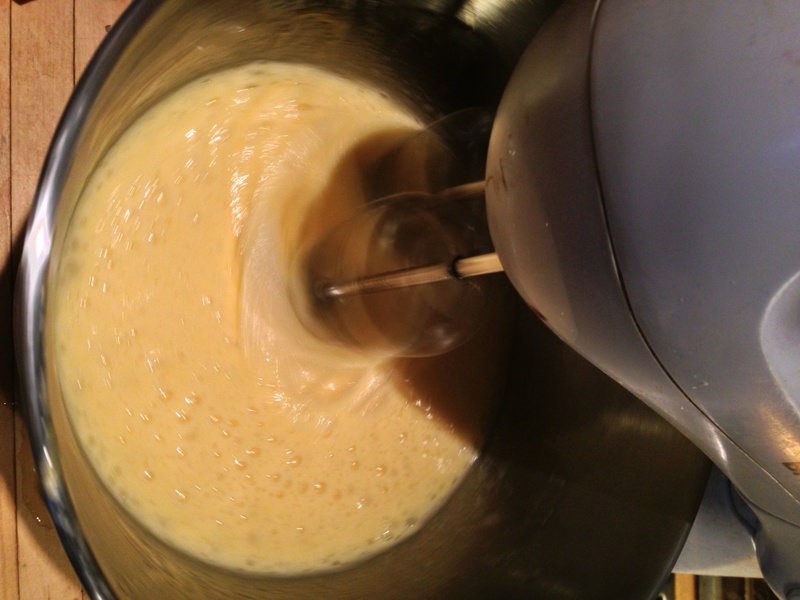 Back to the cake mixture – once your eggs and sugar are a good, dense volume, and leave thick trails when you pick up the whisk, it’s onto the flour. Simply sieve this and fold in slowly and gently with a metal spoon, so as not to destroy too much of the precious air your whisking has created. 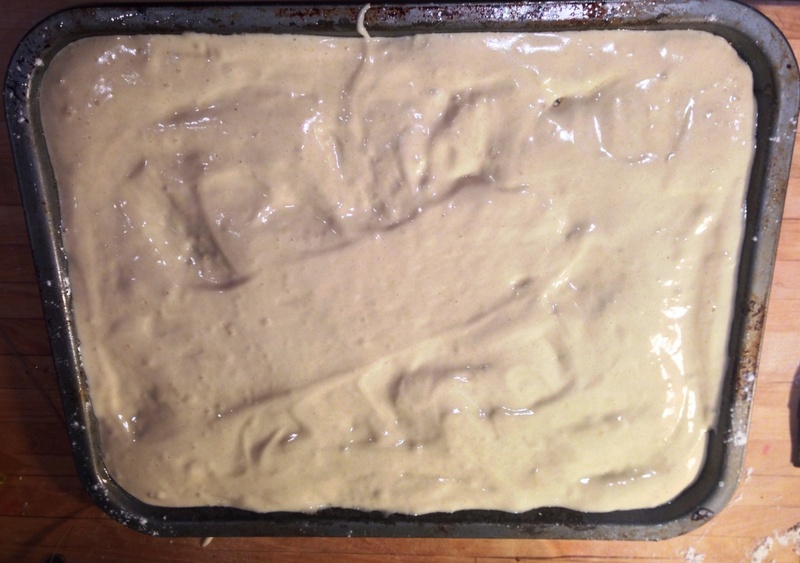 Once well-mixed (and make sure it is or it will not bake evenly), carefully pour or spoon into the tin. As it needs to spread out over a large surface area, try to pour or spoon as evenly as possible. Smooth into the corners and flatten as gently and carefully as possible, remember it is a very aerated mixture. Bake at 180 – 200 degrees for about 8 minutes. Check it after this time as you don’t want it to over cook (or it may crack). The sponge should be light and springy when gently pressed. If your fingers leave dents then give it another minute. 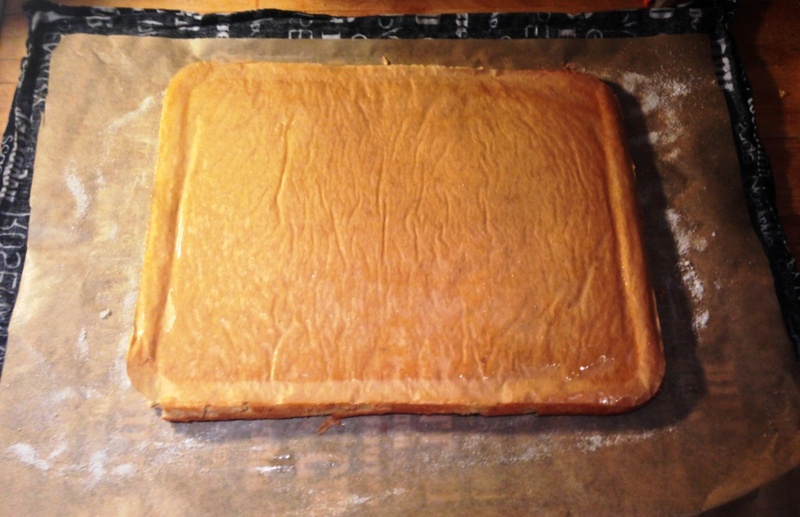 While baking – another step of preparation. 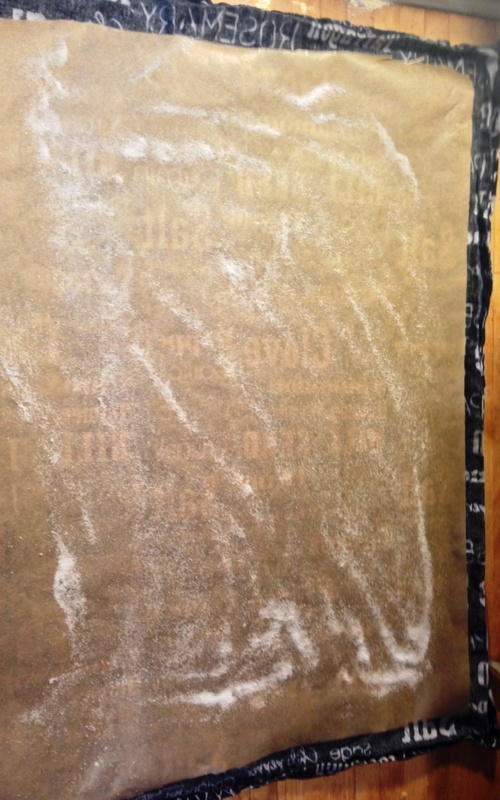 This time a damp tea towel (mine had just come out the wash), covered with a large piece of greaseproof paper (bigger than your tin), and doused in sugar. 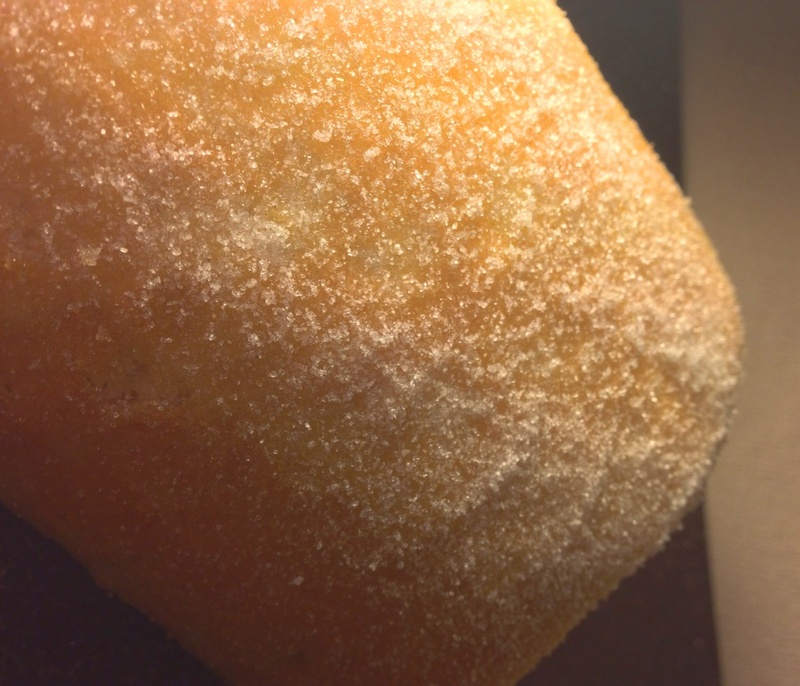 I don’t think mine had enough sugar at this stage as it did stick a little to the paper on rolling – so be generous! …flip! 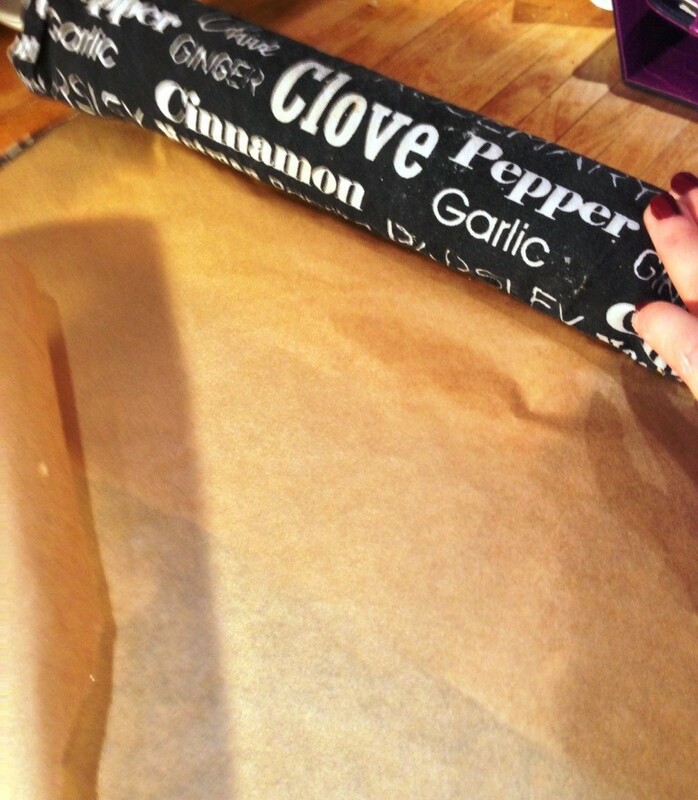 Turn it out firmly and quickly onto the prepared tea towel / baking sheet. 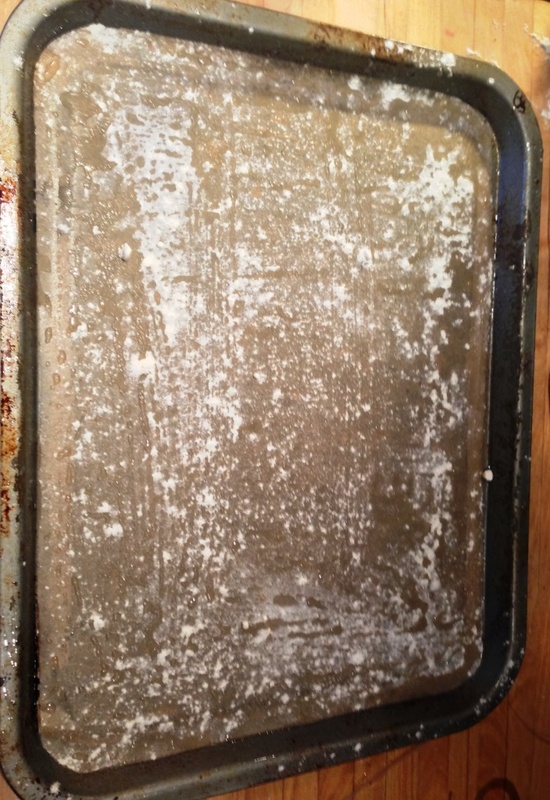 Remove the greaseproof paper backing that the sponge baked on. The oil/flour/sugar preparation should ensure it comes away smoothly and cleanly without tearing off any of the cake. If you are just using jam then you can skip this next cooling stage and you can go straight to jam. As I was using buttercream the sponge needed to cool first so the buttercream didn’t separate and melt when spread on. Regardless of whether you are cooling or jamming, the cake needs to be rolled while it is still warm to prevent it cracking, so work quickly! To allow mine to cool I placed another sheet of greaseproof paper in the middle, then gently used the tea towel and lower piece of paper to guide the sponge into a firm, tight roll. The dampness of the tea towel will also help prevent the sponge from cracking. 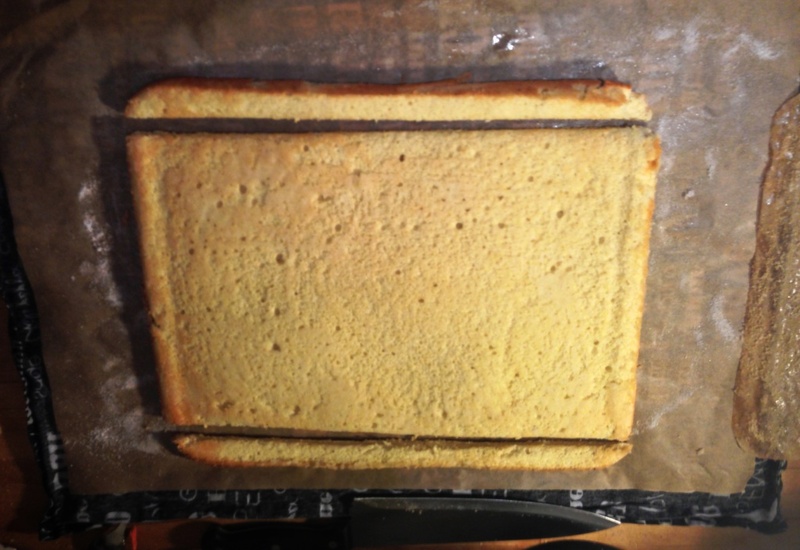 Once fully rolled, I tucked the end underneath and left the sponge to cool. Ok it’s very cold at the moment in our kitchen but it really didn’t take long to cool – perhaps 10 minutes. In this time I made my buttercream. I only wanted quite a thin layer so used a mix of 50g butter to 110g icing sugar. This made quite a stiff icing, which spread on the cake but wasn’t too gooey too ooze out everywhere. Once the cake was cool (you can tell just by gently putting your hand round the rolled tea towel), I very gently unwrapped and unrolled the sponge, before spreading with the buttercream and jam. The rolling was a little more tricky (and sticky!) when there was jam involved, and actually I seemed to have over-jammed, as I ended up with a tidal wave of strawberry near the end (sorry for the blurry action shot!). I quickly scooped this off with a spoon so the end had only a very thin spread of jam, meaning it stuck well but didn’t ooze out everywhere. 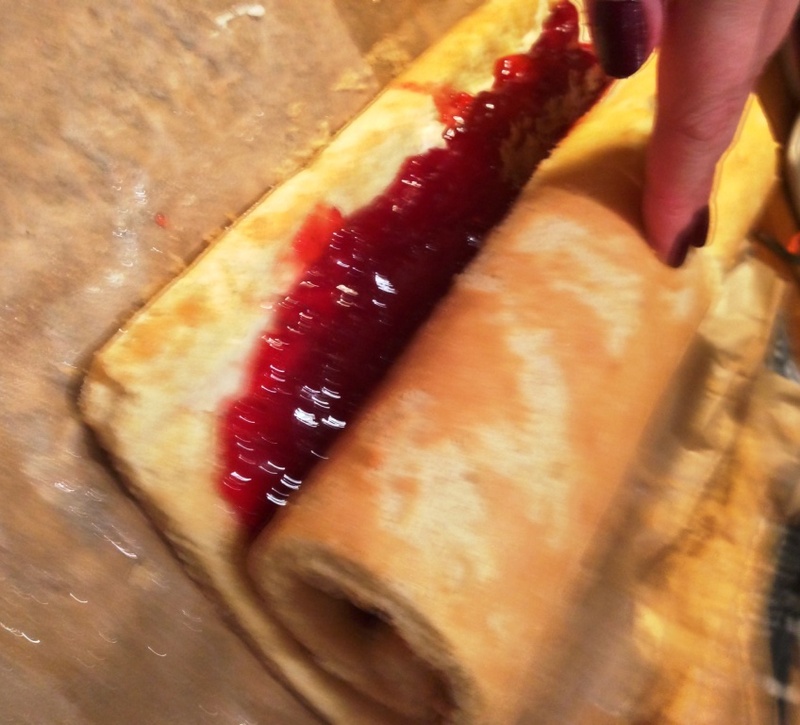 Once rolled, sit the swiss roll seam-side down and leave to rest for a little while. 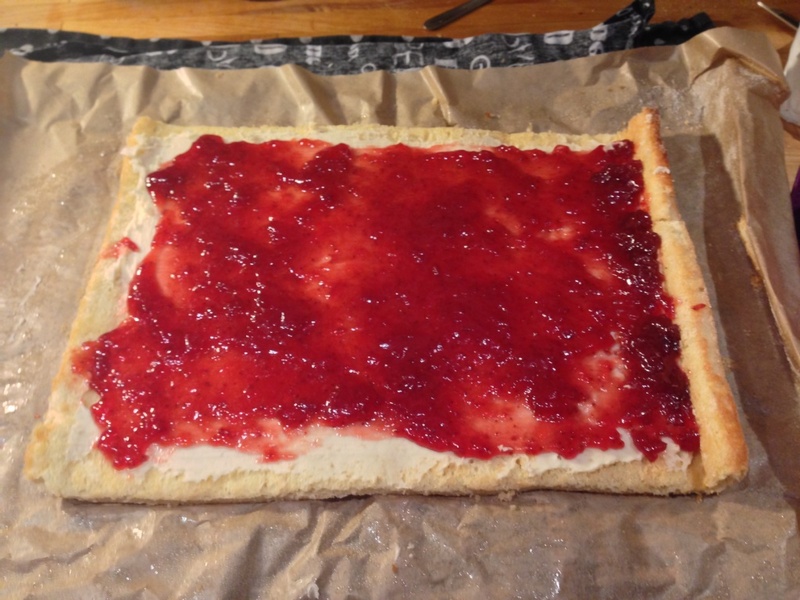 Gravity and jam alone will keep the roll tightly stuck together. The finished product! I was very impressed by my “inspired” choice of dessert – thanks mum… in a roundabout way – and hopefully my friends were too. It is exceptionally good on its own but we had ours after Sunday dinner with lashings of custard – diplomatically and in a way that only good friends could, skipping small ‘polite’ slices and cutting it straight into quarters at the off! 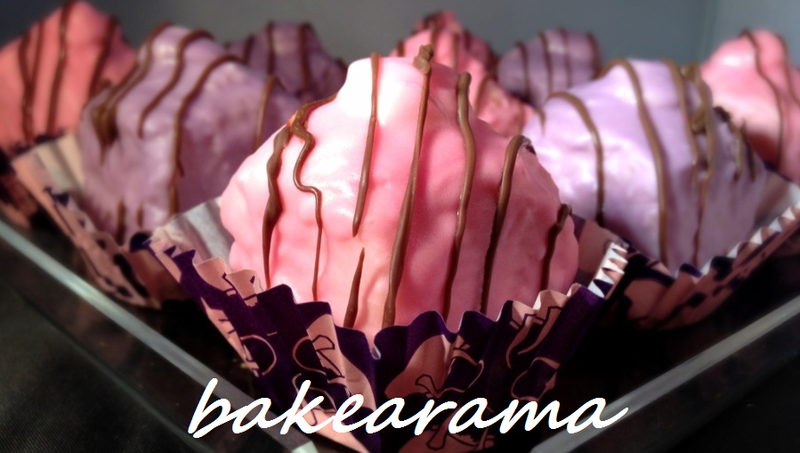 This entry was posted in Baking, Cakes and tagged baking, cakes, ingredients, low-fat, recipe, strawberries by bakearama. Bookmark the permalink. This is one dessert I have never made. My father in-law makes an amazing one (chocolate and very boozy) every Christmas and I always devour it. I think the lack of butter is definitely made up for with cream and chocolate and all that jazz, but I am always amazed by how light and fluffy it is. You make it look really easy. I will have to give it a go soon – dream or no dream! I love the idea of buttercream and jam. Nom, nom nommmm! Thanks! Yes I’ll definitely be conjouring up some devilish versions of my own too – Rob has already requested one filled with chocolate philadelphia – how can I say no! I’m still in awe at how easy it is to make… and how much better it tastes than shop-bought ones!! Ooooh! Chocolate Philly that sounds REALLY good! Looks SO good. I must say I had no idea that there were that many steps involved! It’s easier than it sounds – and so quick, a fab dessert in under an hour is pretty much unheard of! It’s easier than it seems but I think one of those recipes you need to follow to the letter until you’ve got the hang of! 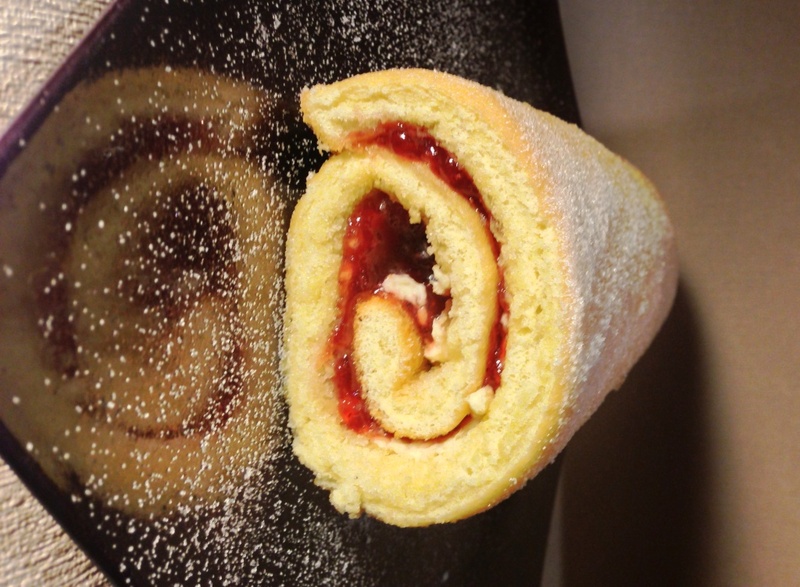 I’ve been thinking about making a Swiss roll too. I think I may have to get on this now. It was easier than I’d thought – let me know how you get on! 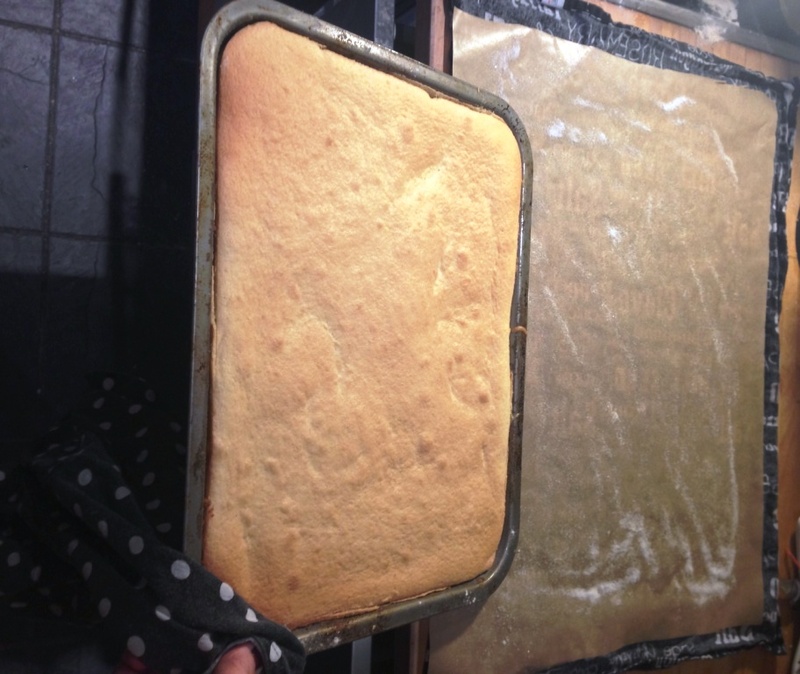 The second one I made didn’t… I think there’s something in just under-cooking the cake so it’s still a bit squishy.